Shaun Mundy is an international leader in the financial literacy movement and serves as Senior Vice President of The Financial Literacy Group. In that role he brings his worldwide expertise on financial literacy programs and policies on behalf of the firm’s clients. Mr. Mundy was Head of the Financial Capability Department at the UK’s Financial Services Authority (FSA) from the inception of the FSA-led national strategy for financial capability in 2003 until 2007. Reflecting the success of the initiatives which Mr. Mundy led, the annual budget allocated to the subject was increased over this period from £2 million to £20 million (around $30 million) and the number of staff he led grew from fewer than 20 to more than 70. In the years since Mr. Mundy’s leadership of financial capability efforts in the UK, numerous other national governments have followed the model offered by his department. 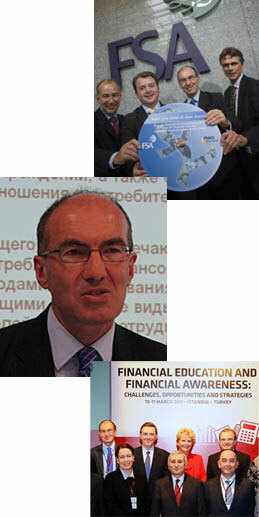 Under Mr. Mundy’s leadership, the FSA and its many partners developed a multi-faceted approach to improving the financial capability of the UK population, with a particular focus on financial education in schools; initiatives aimed at young people; workplace seminars; the development and distribution of a guide for expectant mothers; working with a wide range of partners in the public, commercial and not-for-profit sectors to reach groups of people with particular needs; and the development of the Money Made Clear website and publications. The development of the UK’s national strategy was influenced by a national financial capability survey, a ground-breaking project led by Mr. Mundy. The study was the first major national effort to assess financial capability across a large, diverse adult population. In addition to his work in his native UK, since 2007 Mr. Mundy has undertaken financial literacy projects in a range of countries, including Armenia, Azerbaijan, Belarus, Bosnia, Herzegovina, Georgia, Ghana, Kazakhstan, Kenya, Kyrgyzstan, Laos, Malawi, Moldova, Mongolia, South Africa, Tanzania, Uganda, Ukraine, and Zambia. Mr. Mundy has spoken at numerous international and national conferences and authored important studies including a report for the OECD on financial education in schools and a study on improving financial literacy for the CfBT Education Trust. He also co-authored a report on financial literacy and consumer protection in Uganda for the Bank of Uganda. He has also contributed to the drafting of numerous national strategies on financial education. Prior to being appointed Head of Financial Capability, Mr. Mundy had held a number of other senior positions at the FSA and at predecessor financial services regulators, including responsibility for reforming the regulatory regime for insurance companies; for establishing a regulatory regime for the authorization and supervision of mortgage and general insurance firms; and for supervising UK banks, building societies and credit unions. He was a member of the project team which established the FSA and was also a member of the project team which established one of its predecessor regulators, the Personal Investment Authority. Mr. Mundy’s earlier career was spent at the Home Office and the Cabinet Office, where he gained extensive experience of dealing with senior Ministers and officials. For example, his role at the Cabinet Office included attending weekly Cabinet meetings to take the minutes; acting as Secretary to various Cabinet Committees (including briefing, ahead of each meeting, the Prime Minister or other senior Minister who chaired that Committee); and drafting the Queen’s Speech on the Opening of Parliament. His roles at the Home Office included being Private Secretary to a Minister; and developing legislation and piloting it through Parliament. Mr. Mundy has an MA in Economics and Politics and a Diploma in Criminology, both from Cambridge University. Below is a clip of one of Mr. Mundy’s public appearances.